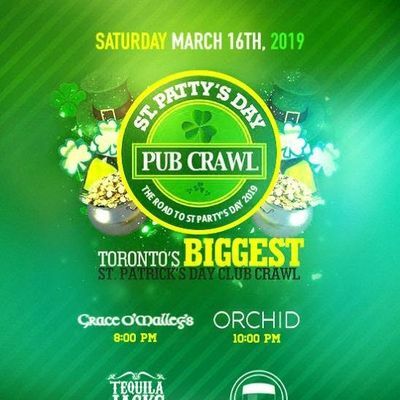 Join us for Toronto's Biggest Annual St. Patty's Day Pub/Club Crawl on Sunday, March 16th, 2019. St Patty’s Day Pub Crawl Lineup: Grace O'Malley's - 8 pmTequila Jacks - 9 pmOrchid - 10 pm The Pint: 11 pm onwardsYou'll pick up your wristbands at the first location (Grace O'Malley's 8pm) and that will gain you entry to the rest of the venues. One person can pick up wristbands for a whole group as long as tickets are printed off. You'll be escorted by your Pub/Club Crawl Host to each venue which grants you line skip if you arrive with them. 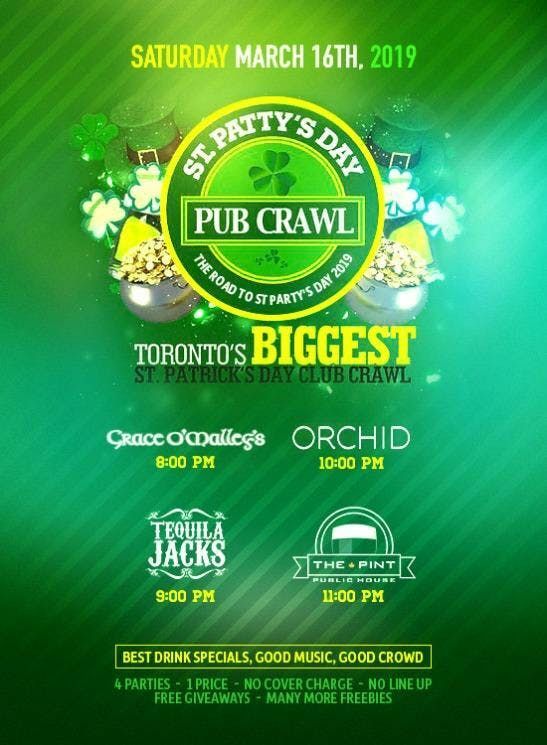 Get your green on and embrace the Luck o’ the Irish this year with Toronto's Biggest St. Patty's Day Pub/Club Crawl.